Kenneth Kaname Kuniyuki, 9Dan, Judo Shihan (Master Instructor) died on November 28, 2002 due to illness. He was 92 years old. Kuniyuki Sensei was born on October 6, 1910 in Seattle, Washington. His parents were Kojiu and Seki Kuniyuki. He was raised in Seattle and started judo training at an early age. In 1932 he went to Japan to train at Keio University under the instruction of Kunisaburo Iizuka, 8 dan at the time (Iizuka later became a Kodokan 10Dan). Kuniyuki returned from Japan in 1935 with the rank of 2 Dan. Kuniyuki Sensei, as a 3-Dan, captained the Seattle regional team against the Nanka, Southern California, team in 1936. His outstanding skill so impressed the head of Seinan Dojos parents group, Jack Wada, Sr., that he was asked to replace the retiring Nasutaro Matsuura Sensei. When Kuniyuki relocated to Los Angeles, he also be came the head instructor at Uyemachi (Uptown) Dojo. Seinan and Uyemachi were the only two dojos that remained open during World War II and the internment of the Japanese and Japanese-Americans. Jack Sergel, 2dan was in charge of Seinan and George Tate, 1dan was in charge of Uyemachi. 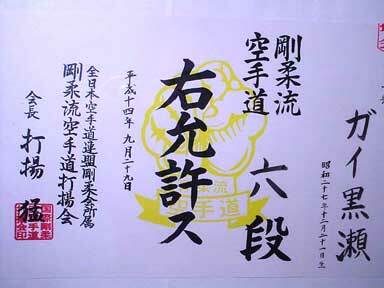 Following the war, Kuniyuki Sensei returned to Los Angeles to resume his management of Seinan Dojo. The dojo began to flourish again with many returning former students in attendance. Notable membership included Bill Asimov, Kaimon Kudo and others such as James Cagney, Rod Cameron and Audie Murphy. Kuniyuki Sensei has been a leader in the judo community for many years and has produced a long history of champions at all levels of competition. He has been a leader in United States judo in the areas of organization, coaching and officiating. 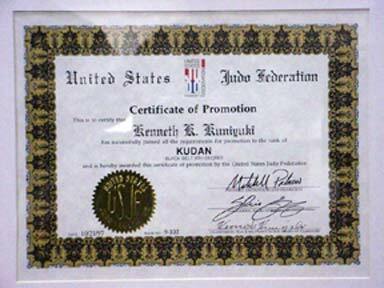 Kuniyuki was instrumental in creating the United States Judo Federation (formerly the Judo Black Belt Federation) and was its inaugural president. He has coached the United States World Championship team. Kuniyuki's officiating honors include being referee in the final Olympic Heavyweight match between Kaminaga (Japan) and Geesink (Holland) at the 1964 Olympics. The old dojo no longer exists but the new one has move to Carson, California under the guidance of several of Kuniyuki Sensei's students. Kuniyuki Sensei had been the advisor until his illness and subsequent death. The current head instructor is Ronnie Kaichi (5 Dan) and others contributing their expertise are old timers Henry Iriye (7dan), Mas Yoshioka (7Dan), Aki Matsuoka (6dan), Larry Kobayashi (6Dan) and Dan Powers (4Dan). Kenneth Kaname Kuniyuki -Kudan -Kodokan Judo. Guy Seiji Kurose -Rokudan -Gojyu Ryu Karate. In a fitting tribute to their sensei (teacher) and mentor, children and youth will speak and perform their martial arts skills during the course of the memorial service. Kurose had an eclectic career, but the constant was always his love for children and youth He had a special place in his heart for them. Through his charismatic personality and story telling, his karate classes and radio programs, his counseling and intervention working at the Center for Career Alternatives, and his motivational speaking, he was a magnet for young people. Wherever he went, he made friends with diverse people of all ages, and was able to transcend race and class with his high spirit, laughter, and quickness of mind. 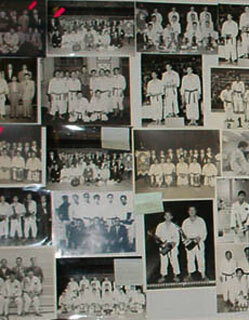 Kurose, an accomplished karate teacher was a trainer for the Canadian Junior Olympics Team. While Kurose was gravely ill in the hospital, his sensei flew to Seattle from Japan and conferred on him the 6th Degree of Black Belt. Kurose had earned his 5th Degree Black Belt some years ago. Kurose was preceded in death by his parents, Junelow (Junx) and Aki Kurose, and brother Roland (Rollie). Aki Kurose School is named in honor if his mother's lifelong commitment to teaching children and working for peace. He is survived by his four siblings: Hugo, Ruthann, Marie, and Paul, and nieces and nephews Kazuo and Toshio Kurose, Maya Barber Kurose, Mika and Mori Rothman, Mason and Miya Woo, Kenji Kurose and the many, many young people who love "Uncle Guy." Scroll to the far right--for Guy Seiji Kurose's obit.